Ink jet printers are non-impact printers that form graphic images and characters by spraying tiny liquid ink drops onto sheets of paper. An ink jet printer's print head mechanism contains ink-filled cartridges, each of which has from fifty to several hundred small ink nozzles. 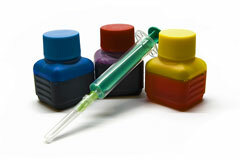 Ink is propelled through a combination of nozzles to form a printed image or character on paper. Most ink jet cartridges use thermal printing technologies in which a tiny drop of ink is quickly heated and vaporized to form an expanding ink bubble and expel a tiny ink droplet through the ink nozzle. Epson printer cartridges use a piezoelectric printing technique, in which a tiny crystal, expanded by means of a momentary electric current, expels the tiny ink droplet through the nozzle. Most ink jet printers feature a black ink cartridge and one or more color ink cartridges. When a cartridge's ink supply is exhausted, the cartridge can be easily replaced. HP, Epson, Canon, and Lexmark each offer replacement ink cartridges for their ink jet printers. However, these OEM cartridges are expensive, and there are several ways to save on ink jet printing costs. The greatest savings are generally available by recycling your cartridges, either by refilling them yourself or by sending them to a company to have them refilled and sent back to you. Substantial savings are also available by buying remanufactured or compatible printer cartridges. However, ink cartridges from third-party suppliers may contain inferior quality ink that fades faster than the ink in OEM ink jet cartridges. If you purchase OEM ink cartridges for your printer, the Imaging Supplies Coalition suggests buying them from original equipment manufacturers or from one of their authorized resellers. Counterfeit ink cartridges can leak ink, ruin prints, and damage your printer. The ink jet cartridge suppliers listed on Ink-Jet-Cartridges.us offer an extensive selection of ink refills and cartridges for many popular printer models. 123Inkjets.com supplies remanufactured and compatible ink jet cartridges. Bogus Ink Stink is a PC World article that highlights concerns about third-party ink cartridges. Imaging Supplies Coalition (ISC) is a non-profit trade association comprised of printer manufacturers and original equipment manufacturers (OEMs) of consumable imaging supplies such as printer ribbons, toner, ink, and cartridges. Visit Color Printers to find ink jet printing and laser color printing equipment. Visit Computer Supplies to find digital storage media and printer supplies.